Part of the problem with Zube’s LMP project is the sheer volume of material. He’s put over 500,000 pages onto microfiche, and I have to rely on archived version of his indexes, and not everything was indexed digitally… and then, really, you have to know you’d be interested in something to search for it. And even then, and index is only so complete. So, while I was scanning pages from egoist journals The Storm (1976) and Minus One (1963), I stumbled across INVICTU$. Subtitled “A Journal of Objectivist and Libertarian Opinion” and “Published by the CSCLA Students of Objectivism”. “We’ll that’s neat” I thought, and I scanned the first page. I was there for other stuff, but I scanned it to remind myself that it existed and I should go back to it. Of course, beginning on PAGE TWO, is an aticle titled “F.C.C. : FASCIST CENSORSHIP COMMISSION by Louis Rollins.” And the name made a light bulb go off, and it was a few keystrokes over to The Hoover Hog blog, run by my comrade Chip Smith to reread his eulogy for L.A. Rollins. L.A. Rollins received his B.A. degree in philosophy from California State College at Los Angeles in 1970, which happens to be the year I was born. Throughout the glorious decade that followed he edited and published a sporadic fringe-libertarian newsletter called Invictus: A Journal of Individualist Thought (Good luck finding a copy). Well, no luck needed at all, just a second generation German anarchist in Australia who obsessed over putting out 1,770+ microfiche with amazing material on them for many decades. I purchased archival storage materials for my small first order of microfiche. Still about 70 microfiche holds years of reading material. You could have the total series of 1779 issues for the equivalent of US $ 1779, less the issues you already have, or those, you do not really want. QUOTATIONS ON LIBERTY, see e.g. 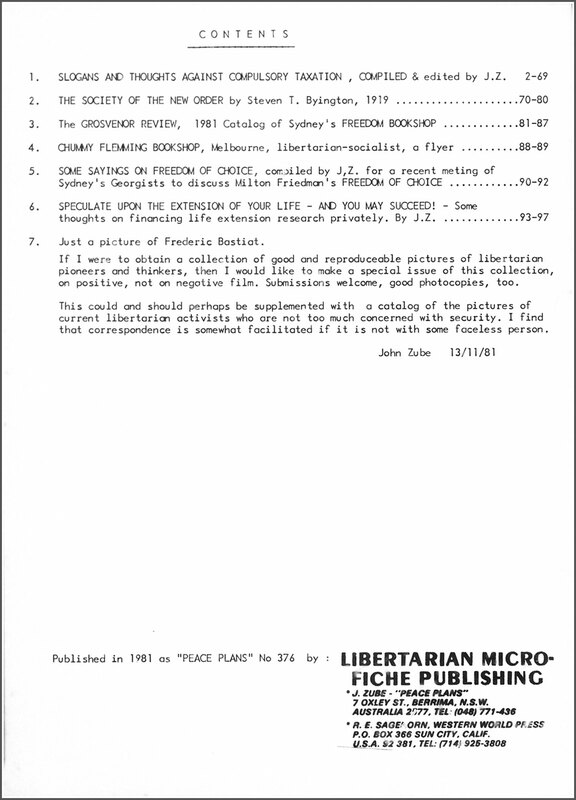 LACONICS OF LIBERTY, compiled by Sprading, PP 220/21, L.E. Read, An ABC of Freedom, Slogans for Liberty, Spencer, Sumner. See FREE MAN’S ALMANACH, The Forgotten Man’s Almanac (1093). Firstly, I would like a complete list of all such handbooks. Secondly, I would like all of them to be made available on microfilm. Thirdly, I would like these compilations scanned and integrated into a single collection, to be made available on fiche and disks. Then I would like a scanning and search of the ca. 15000 different books of quotations, for truthful ones on liberty and related subjects, to be finally added to the encyclopedia of Slogans for Liberty. Only then would we have all this proverbial wisdom sufficiently mobilized. To this ought to be added encyclopedias of definitions and of the best refutations so far found or myths, errors and prejudices that remain obstacles to progress. (Towards the latter, I do also collect A – Z handbooks.) I collected towards the quotations project e.g. : Peter’s Quotations, Seldes, The Great Quotations, Mencken’s book of quotations, Timko’s Libertarian Cartoons & Assorted Quotations, vol. I, Bachman’s Book of Freedom Quotations, Bierce, The Enlarged Devil’s Dictionary, Berman’s Quotations from the Anarchists, Bufe’s The Heretic’s Handbook of Quotations, Rollins’ Lucifer’s Lexicon, intend to buy from LFB at least: Scasz: The Untamed Tongue – A dissenting dictionary & Winokur, The Portable Curmudgeon. I possess among others: Dagobert D. Runes: a) Dictionary of Thought, b) Handbook of Reason, c) Treasury of Thought, d) A Book of Contemplation. I filmed my own ABC Against Nuclear War (in pp 16-18), Read’s ABC of Freedom, Percy Greaves’ Mises Made Easier, and am always on the lookout for more such handbooks. Anyone ready to swap for some of my fiche? My own compilation, Slogans for Liberty, may come to ca. 20 fiche. So far only vol. I – IV are out, covering A to part of D, with a total of 840 pp. The rest – when I get around to do the keyboarding. – I wish libertarians would at last apply division of labour to such projects. See: SLOGANS FOR LIBERTY. – J.Z. This was after the meticulous index created by Zube for a microfiche containing ALL 455 pages of this obscure anarchist journal that comprise issues 1-10. Amazing. And, well, by trying to research the project itself (something that in itself should have someone dedicated to do), it seems like any year now it could become entirely forgotten, much less how obscure it seemed to be as it was operational. And I’m in awe. Did anyone else save a copy of a Chummy Fleming Bookshop flyer for the ages in an archival format other than paper? Did anyone save a paper version? Does anyone care? I don’t know. Will I turn into the 21st century John Zube, constantly making appeals to others to assist me in producing the greatest egoist resource ever produced? Christ I hope not, but is there another way to obtain an acquisitions budget as an individual unaffiliated with an academic or other non-profit entity? Do I really just funnel the meager profits from Underworld Amusements into a free resource for others? No, that can’t happen either. Circling back to INVICTU$, I’ve taken about 10-12 hours of personal time to sit in a room with microfiche scanning equipment to digitize an amazing amount of work that will eventually see the light of day in digital or print form, emanating from the UoE project. I’ve invested hundreds of dollars into research and archival materials. So I’m thinking I definitely need an acquisitions budget. That’s not going to be sufficiently generated from profits of selling books or other items. I’m pretty sure it needs to come from you, the person interested enough to read this far. If you have thoughts on the subject, please contact us. Previous Post Is Shakespeare Dead?